Therapy Groups — City Kids Inc.
City Kids offers a variety of therapy programs to fit your child's needs. We understand that each child is different and unique and we do our best to cater to each child's needs. This therapeutic playgroup addresses language skills, social skills and how to get along with each other in a group without a parent! 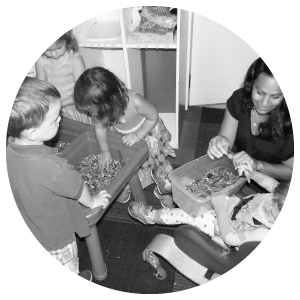 This group is open to all children (2-4 years) and is adapted to meet each child’s needs. Developed for highly verbal children to address peer interaction where we dissect socially abstract concepts and teach them more concretely. These groups of 3-6 children are based on their age and developmental skills/abilities. Varying groups available for ages 4-12 years old. In this setting, there are 3-6 children working with 2 therapists. Utilizing the SOS approach to feeding, therapy works to expose children to more foods in a setting that is fun and interactive. How do I know what group to place my child in? This is a question that will be answered by a conversation with a therapist that leads group sessions. Please call the therapist listed under the group you think your child should attend. We work hard to provide optimal insurance billing for each family. Some companies pay for groups and some do not. Please call the office and discuss your options with the office manager, Gale Wallace X101. Most groups are 5-8 weeks in length. They vary with the holidays and cycle of each group. Each weekly session is 45 minutes for Social Groups and SOS groups to leave time to discuss homework with the families. Little Learners is two hours in length each day. How many kids are in each group? Our ratios are low. There are 6-8 (approximately) children in each group and often two therapists or a therapist and a teacher. We also have volunteers to help with children that require one on one support. When you sign up for a group you pay ahead for the entire class. If you have an extreme situation with an illness or hospitalization we are happy to prorate the class to accommodate your child’s needs. We know children often have colds and runny noses but if your child has a fever or a contagious disease we ask that you keep him/her at home to recover and prevent the spread of illnesses.